In the small town where I live, we have a good old-fashioned daily local rag, the Watertown Daily Times. And naturally it has a Letters to the Editor section where anybody who can put words to paper can submit their opinion on anything they want. Left-wingnuts, right-wingnuts, True Believers, young earth creationists, global warming deniers all take their shots at free speech glory. And most of the time it's some of the funniest stuff in the paper. But there are times when a writer (or writers) are so off base, that I can't resist jumping in to point out the nonsense of their thesis. 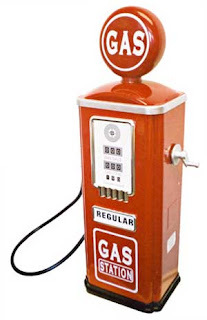 To all of the letter writers decrying the perceived differences in gasoline prices from town to town, please stop. Your concerns over the price of energy are wholly misplaced. You need to do some analysis to figure out where your money is really going. Just because you see prices are higher in Watertown than they might be in Juneau at a particular point in time does not mean that they are always higher. Personally, I find gas prices in Hustisford to be consistently (but not always) higher than Watertown. On the whole, I very rarely see a difference of more than five cents per gallon per week, either positive or negative. (Also, at $3 per gallon, 5 cents is less than 2 percent of the price, itself insignificant.) Let's begin our analysis then with the worst case, assuming that gas prices are always five cents more in Watertown than anywhere else. Next, let's assume you currently use 10 gallons of gasoline per week (520 gallons per year). Paying 5 cents more per gallon over the course of a year nets a grand total of: twenty-six dollars. Using 20 gallons per week? Fifty-two dollars. Want to talk real money? Look at what you're driving. There's a good chance the automobile you drive is getting just 20 miles per gallon. And let's say, because of your gas guzzler, you consume 20 gallons per week (1400 gallons per year). Now drive a car getting 30 miles per gallon, which means you use 33% less gas. At $3 per gallon? A savings of $1386 per year. Now THAT'S real money. Scale it from there; no matter how you cut it, driving a fuel efficient car is the best way to save real money. And that's the bottom line. And the punchline? The automakers make the greatest profit margin on the vehicles that use the most gasoline; your pickup trucks, SUVs and luxury cars. And insurance rates are typically higher for those vehicles than for economy cars. I don't hear any outcry over any of that. Can't afford to buy a new car, even with all of the cost upside? Spend a few dollars to make sure your car is in fine tune, the tires are properly inflated, and slow down a little, and that perceived price disparity between Watertown and Sullivan will disappear. So stop being a victim and do something about it. Please. 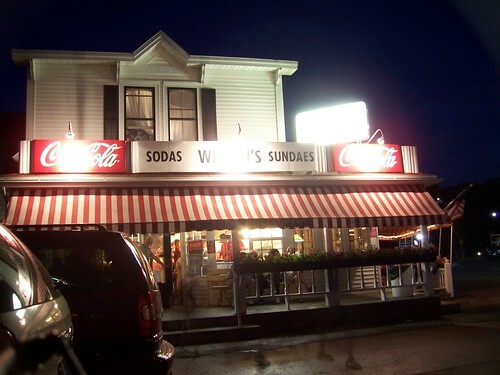 Wilson's Restaurant and Ice Cream Parlor in beautiful Ephraim, Wisconsin. Open since 1906. I can think of no better way to enjoy a summer treat, in one of the most beautiful places in Wisconsin. And since this is the cherry capital of the state, why not do as the Romans do and have a big cherry sundae? 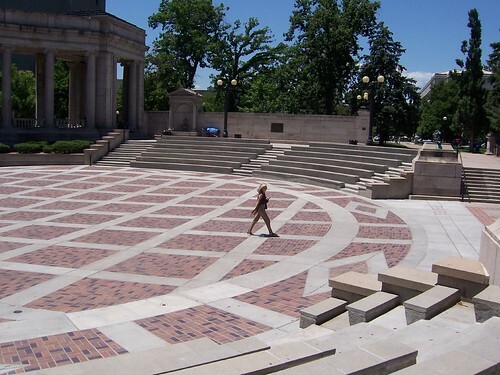 A woman strides confidently across the floor of the Greek Theater in Civic Center Park on a warm summer day. 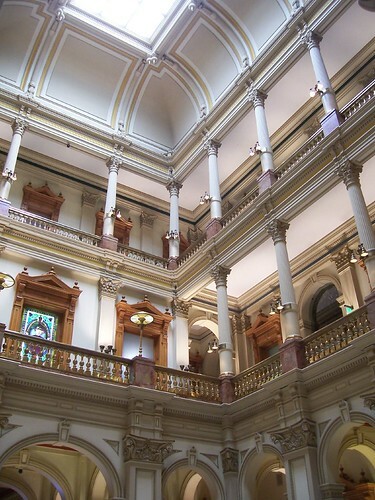 Denver, Colorado. Another plane seen at my local airport this summer is this beautifully restored Stinson L-5 Sentinel, owned by Sam Tabor of East Troy, Wisconsin. With short field takeoff and landing capabilities, and the ability to operate from unimproved forward airstrips, the two-crew L-5s were used during World War II for reconnaissance; delivering supplies to, and evacuating litter patients from, isolated units; rescuing Allied personnel from remote areas; laying of communications wire; transporting of personnel; and -- on occasion -- as a light bomber. Nicknamed "the Flying Jeep," the L-5 demonstrated amazing versatility, even landing and taking off from tree-top platforms constructed above a thick Burmese jungle which could not be cleared for more conventional airstrips. 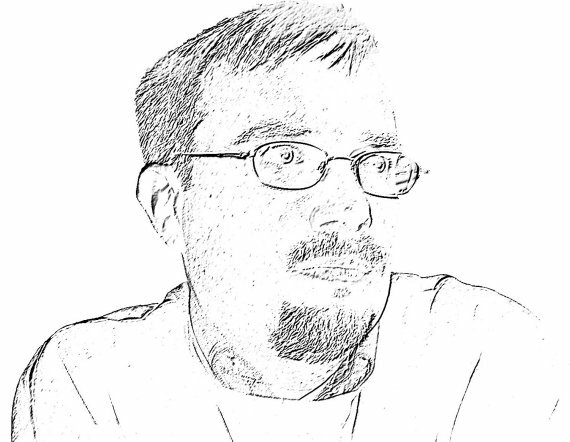 At long last, another season of Mr. Diety is on the way. Me? I wanna know how the Lucy character develops. First, Jesus appeared on french toast. 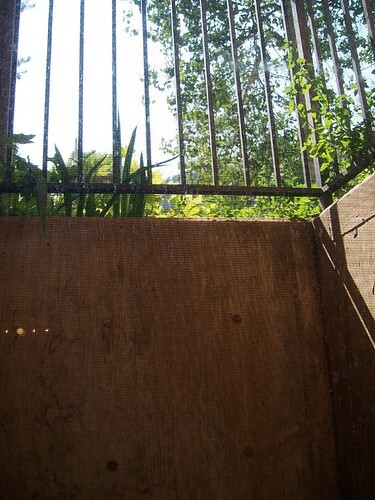 Then he appeared in a fence. Now, he's on a crepe. Holy crepe? A tip o' the hat to the Bad Astronomer. Remember the great steakhouse I told you about a while back? Well, I had a chance to return there this evening for another fine piece of meat. This time I managed to capture a few images of the place. Doesn't look like much? Then you forget that it's not the look of the place that brought you there. 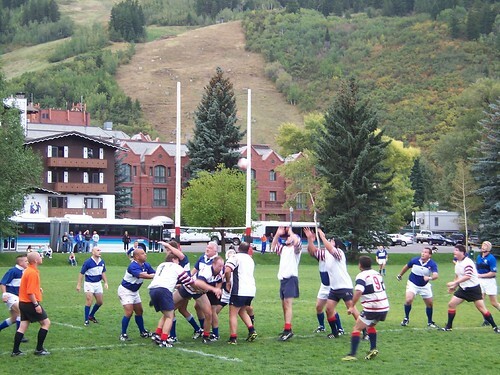 As I bid farewell again to Aspen, I caught a game at Wagner Park. Imagine coming from, say, Kansas City, and you need to play at least 3 games at 7900' of altitude. I got there Monday and finally got over the mountain sickness by the time I got on the plane to go home. But to play rugby the day after getting there? Yikes. But there was beer, too. Believe me, I didn't select this room, or this hotel, for that matter. I've been trying hard lately to make sure I get up in the air at least once a month to keep the rust off, so this morning I headed to Racine, Wisconsin for a pancake breakfast sponsored by the local Experimental Aircraft Association Chapter. What I did not expect was this gorgeous airplane. In 1935, Herbert F. Johnson Jr. and a crew embarked on an expedition to northeast Brazil. The purpose of this trip was to discover new stands of carnauba palms and whether existing growths could sustain the demand for raw material for Johnson Wax. The model S-38 aircraft was remarkable in its day, flying a number of history-making flights in the 1920s and early 1930s. 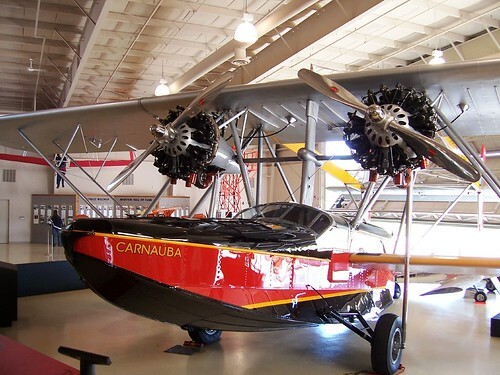 One of which was Lindberg's 1929 inaugural airmail flight for Pan American Airways from Miami to the Panama Canal. 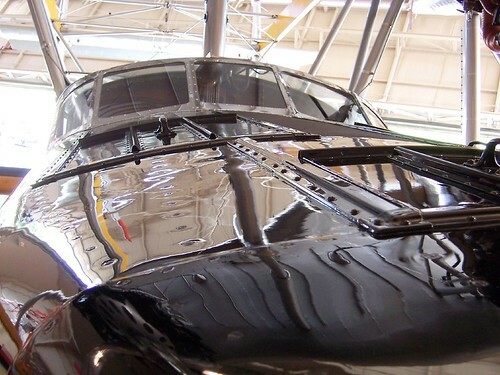 Of the original 100 Sikorsky S-38 planes built, none still exist. This prompted Sam Johnson to have a replica built using the plane's original blueprints. The construction of the replica was done at Born Again Restorations in Owatonna, Minnesota. It took over three and a half years to complete, requiring more than 35,000 man-hours. 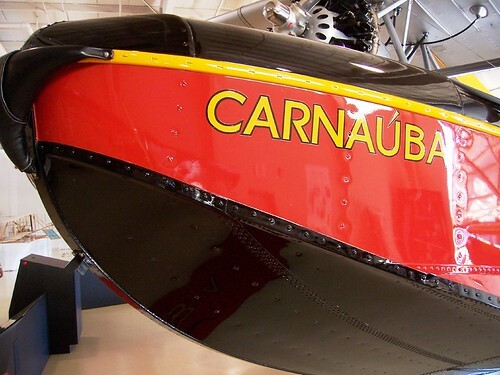 Upon its its completion, it was christened the Spirit of Carnauba. The S-38 replica has a range of 550 nautical miles. Cruising speed averages 100 miles an hour. The aircraft is powered by two 450 horsepower Pratt & Whitney Wasp Jr. engines. The upper wing spans 72 feet. In fall 1998, Sam Johnson and his sons, Curt and Fisk, embarked on a journey to replicate the original 7,500 mile trip flown in 1935. Their trip took 27 days and concluded successfully in Forteleza, Brazil. Summer is winding down here in Wisconsin, and I still have a ton of material to share. It's been a busy summer here at This Blog Title For Sale, so a retrospective over the next several posts is in order. 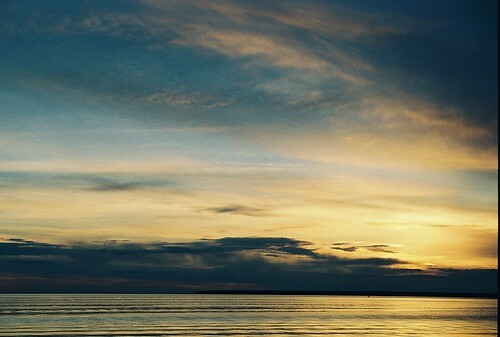 This is an early July sunset over Sturgeon Bay as seen from Fish Creek, Wisconsin (with a tip of the hat a fellow blogger from Mona Vale, a master of this type of photo). 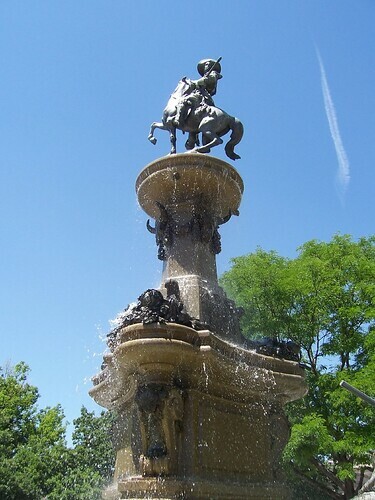 Located in Civic Center in downtown Denver, the Pioneer Monument Fountain was a part of Mayor Robert W. Speer's City Beautiful movement. Originally sculpted by Frederick MacMonnies in 1911, sculptures of a prospector, a hunter and a gun-toting mother with her child surround the central figure of Kit Carson on horseback. Lines, wires, wood. Power, commerce, information. All that and more, right here.